System Loadmaster’s rig walking systems are widely used globally, providing a unique solution for today’s land rig drilling market, where moving from well to well without having to rig down is becoming an industry standard procedure. Loadmaster currently has designs for several rig configurations: box on box substructure, parallelogram leg substructure, for rigs with 400,000 lb and 1,500,000 lb hook load capacities. 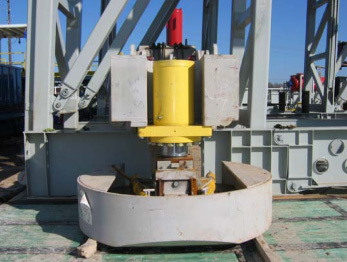 Our robust system is designed to move the rig, with all equipment, and full setback, unlike a conventional drilling rig that must be rigged down to move a short distance, saving the contractor lost day rates and additional costs. Configured originally for its Big Easy series of rigs, Loadmaster has customized the system to meet the needs of specific drilling rigs and programs. Our walking system can adapt to existing rigs for pad drilling in linear or quad well arrangements. 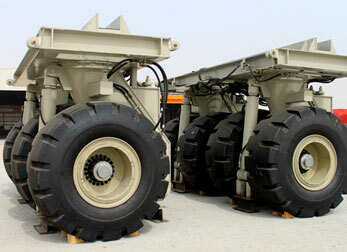 The units have been supplied in 800 metric ton and 1200 metric ton capacities, with walking strokes of 36 inches. The system can walk the rig in any direction, or rotate about the rig’s well center. 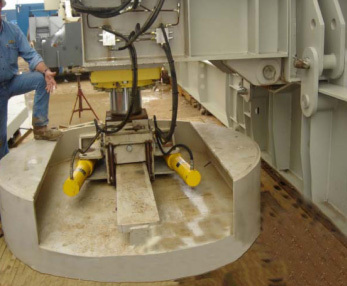 This mobility can allow the safety of a mast and substructure erection completely off of the well row, and walking of the rig onto the well row after raising. Our patented synchronized hydraulic steering with PLC control is also available. Additional benefits include easy and safe well-to-well moves on small drilling locations, as the walking system can walk the rig in any direction. The system is hydraulically operated with optional PLC controls.